But as I told my wife as she started freaking out last week – AT LEAST WE HAVE MONEY TO LOSE!!! We should be so lucky!! If it’s not affecting your daily life, you’ll do well to count your blessings. ROTH IRAs (-$12,090.58): Double vomit. See above. SEP IRA (-$47,062.78): Triple vomit. See above. Or better yet, see this graph of how it’s performed *overall* these past few years – a much prettier (and accurate) picture! And that’s December! How’d you guys do??? Anyone kill it? Anyone lose *more* than me? How lucky are we to even be alive right now???! Or have water/food/shelter/INTERNET???? Don’t make me whip out that cemetery thesis again…. Hey we lost about same too in December! Although one doesn’t notice it :) Christmas isn’t about money. I had a scary ER trip and “How lucky are we to even be alive right now???! Or have water/food/shelter/INTERNET??? ?” is literally all I was thinking/thankful about every second since then. Market schmarket! How was your holidays J$?? I think everyone lost unless they were all in bonds or bought some mysterious winning individual stocks. No biggie. As you say – at least we have money to lose! So it would have taken an equity unicorn or market timing of some sort to gain. For the moment, the “scaredy-cat” portfolio allocation is working for me. 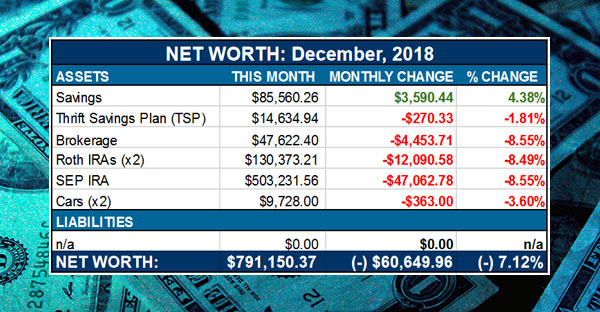 My end-of-year net worth came in at $892.6K. While that is (unfortunately) down 2K for the month (and my last all-time-high NW of 894.6K), it is up $82K for the year. That may appear to indicate a 10% increase year/year, but it isn’t entirely attributable to return on investment. First, I have to deduct the estimated change in equity. Zillow gave me a generous increase of $25K on my home’s current “value”. Then subtract out the amount I paid down on my mortgage principal ($9.8K). You also have to take off the amount I and my employer have pumped into my accounts through savings from my income ($34K). This leaves about $13.2K that I believe legitimately comes from investment returns. With a starting retirement account(s) total of $567.3K (starting NW was 810.5K), that works out to about a +2.3% return in a very difficult year. Hell, if the CPI really is down around 2% I might actually have had a positive real return! First of all, is that a picture of you!?!? Whaaaaat! I’m used to just seeing that little black and white pic. Hahah…nice beard sir. Anyway, in times like these I like to watch YouTube clips of WB saying all you need to do is invest in a low cost index fund such as the S&P and never read another headline in your entire life. He’s seen several wars, many political parties in power, 9/11, the recession, etc…and America keeps marching forward. His down to earth ways and trips to Dairy Queen warm my heart. A Peanut Buster Parfait with Mr. Buffett. Wouldn’t that be something. We are right there with you J. We’ve been regularly buying and had some bonuses to put in in December. Shares over dollars right now. Shares over dollars – i like that! Look at the long view – your Net Worth at the end of 2008 was like $64,000. End of 2018 you are at $791,000! Pretty dang good results over the long haul. I own some Chipotle, which was up like 45% for the year last year. 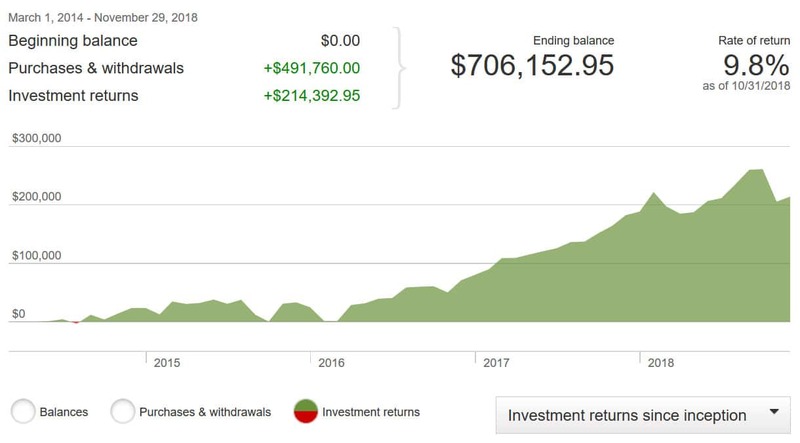 I don’t own enough to offset my index fund IRA, but at least something on my account overview at Vanguard was green! Happy new year, J$! For December 2018, we were down $105.2K, so I guess we have you beat? 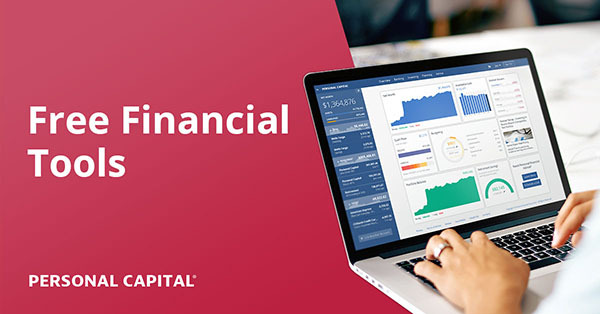 Similar to you, our cash balance was up while our brokerage, Roth IRA, and 401(k)/403(b) accounts and home and auto values were down. It didn’t bother me as much as some might think because I spent a good part of the roller coaster ride overseas ignoring the financial markets. Is there still time to get back on that plane? I know my future self is going to thank me though for sitting tight, not selling and continuing to focus on savings instead! I’ve been waiting for this bear market to present itself, secretly hoping it would happen before I retire and not after. So you can blame me. Everything that happened to your portfolio happened to mine at a rate of about 4x. My portfolio was down about $500,000 peak to “trough” (if that was the trough — probably not, but maybe) and we bounced back nearly $100,000 the day after Christmas. Throughout it all, I pretty much shrugged my shoulders. Did a little tax loss harvesting, but otherwise I realized the number on the screen doesn’t affect my day-to-day. It’s a good attitude to have. Yeah I’m down about $50k. Plus about another $1300 every day this gov’t shutdown stays in tact. Every article I read talks about the poor gov’t workers even though they will essentially get a paid vacation after this is all over. No one talks about contractors who get $0 now and $0 later. Furloughed workers won’t get paid. The only ones who will probably get reimbursed are the ones working and getting no paycheck right now. Sorry to hear that bro, but as the saying goes, “It is time in the market, not timing the market.” That being said, the charts I watch showed we might be in for a rough time ahead, so I sold all our investments before the downturn. Our net worth was up a meager 0.5% for the month from paying off debts, but we were up just over 40% for the year. The advantage you have is that you can keep investing while the market is down helping your overall return. Meanwhile, we continue to pay off debts and look for value investing opportunities to reallocate our cash. Here is to a better year for us both! Thanks for the update and for staying so positive despite the recent negative results! Wow, you did great this year! When did you unload your stocks? And what drove your decision to time your move when you did? Always looking to improve my results. Thanks for the reply. As I mentioned in my most recent net worth blog post, I pay attention mostly to the Dow. I use a method that I read in a book several years ago. It combines the Simple Moving Average, Moving Average Convergence Divergence (MACD), and Slow Stochastic oscillator. These three together tend to show a general trend in the market. The three began showing a downtrend last June. 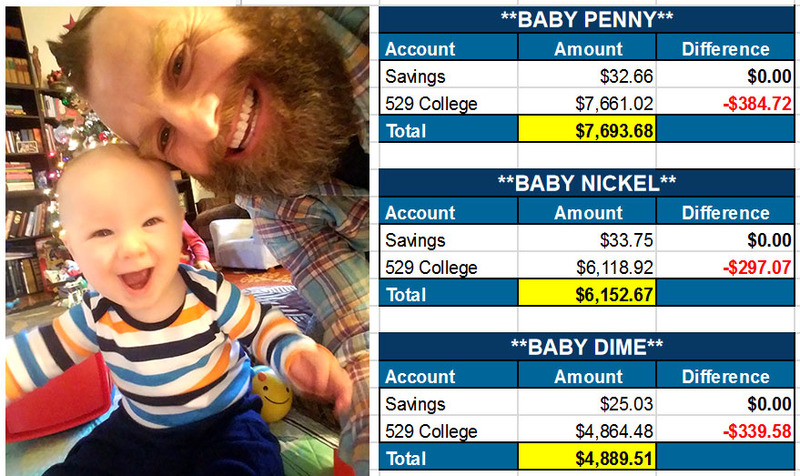 I moved my 403b, 529, Roth IRA, and my wife’s IRA and Roth IRA to cash or as close to a cash equivalent as I could. These accounts amounted to about 20% of our retirement. I owned some stock that I thought might continue up for a bit. I sold it for a nice profit November 3rd just after I received another downtrend signal. The stock continued to go up, but is now back down below where I sold it. I will move the accounts back into the markets when I see a reversal. I may miss a little of the upward move, but should not experience most of the downward trend. One thing that may change would be if I find a great deal on an individual stock that is worth purchasing. I know most personal finance and FIRE bloggers are more passive investors, but perhaps I should put a post together showing how to view these indicators. Someone might find it useful. You mentioned that to me before. The difference is that we have such a massive amount of debt that all our money is going to pay off the debt and very little is actually being continually invested. You have the ability to continually invest, so you will weather out all the market ups and downs. I was just trying to preserve the capital that we have so that hopefully we can purchase again when the market stops being so crazy. Meh. Paper losses. Take it from this old gal, the market will (is already) come back. The average length of a bear (bad) market is about 21 months. You got two years before you need your money? Then just think of this as a way to get your average stock purchase price down. Hope the new(ish) site is still going well! My man! Wanna feel better? My NW is down over $200,000 since a high on Dec 3! I probably add in about 60K per year, so thats over 3 YEARS worth of contributions in one month! When you are younger, its just a time to buy more, but for those of us older its a wake up call. What have I learned? That I am not as risk tolerant as I thought. I will be looking to rebalance when I can as my FIRE date is nigh, and unlike you I have no other source of retirement income stream other than my stash. Hi J$! Words of wisdom to ponder as we all can find blessings in the financial insanity if we so choose. This is the year I step up and acknowledge my Net Worth. Scary, but honestly I am grateful for your monthly report, and for those who choose to share theirs. My worth is measly compared to many of you but it’s only getting better as I learn. I have a question about how to figure my employer-paid pension into my net worth. When I look at my balance, there is a straight balance and an estimated, as my employer reports once a year, in October. I feel better taking the true balance because this year, for example, I earned almost $10K in overtime (my choice), which would not have been included in my estimate. We’re not talking a massive sum, but this girl picks up pennies! Any advice is welcome. Happy and successful new year! May your opportunities be many and your goals realized. I actually wrote something about this and net worths a cple years back, lemme see if I can find out…. See if anything there helps, especially the comments below as there were tons of great opinions if I recall. Hands down best value Minivan – Dodge Grand Caravan. Get the second from the bottom of the line (SXT?) with the stow and go seats. Buy no other options other than what comes with it. Look for a new 2018 model. It’ll be cheap. I bought one new in 2015 for $21,995. I use it for my business, and for personal transportation. I love it I’ve had 5 vans but this is easily my favourite. Or a three or four year old one with low miles. Dollar for dollar, pound for pound the best van IMHO. My old van is still worth $14,000. 57,000 miles so far, so the cost of the van (ie. depreciation) has been about $0.14 per mile. And it’ll just get cheaper from here. If I keep it 10 years and put 200,000 miles on it, that’ll take the cost down to $0.11 per mile. That’s cheap. Yes, I understand, gas, maintenance, insurance is extra. But for a family vehicle that has lots of size it’s a bargain (no I do not work for Dodge). We prefer to think of it as finding a really great sale on mutual funds as opposed to, you know, HUGE losses. We lost more in our Roths than we had put in during the whole year, but when that baby bounces back, we’ll be like Tigger. It has been a good test of our belief in our own resilience against loss. Neither my husband nor I batted an eye. Ride a painted pony let the spinnin’ wheel spin…. Let that puppy spin and just smile knowing it’s coming around again and you’re already onboard. I seem to be in the vast minority to have had a positive net worth last month. I was up just under $3k. My assets were no help – those were down over $11k. But I killed it with debt reduction, to the tune of over $14k – yay me! That put me up $67k for the year. At least you’re starting the year down so you have nowhere to go but up! Oh $hit!!! Good for you!! Ha ha J$! Yup, an honest to God pension. I’ll read the article/opinions and I’m sure it will be very informative. More education time for me. Thank goodness for the post Christmas 8% rally! Otherwise, things woulda been so much uglier! My overall public equity portfolio eeked out a 0.8% gain, but I had to trade my House Sale Fund like a maniac to get there. Too stressful, and I’ll be taking a break this year. I’m hoarding some cash in case it drops further. I want to be ready if it does. Our net worth went down 3.2% in December, but we still managed a 14% net worth gain for 2018 in total. We did a great job saving this year (38% of gross income) and also cashed out some stock options which more than offset the market losses. My husband looks like a genius now for telling me to sell all his stock options in September. PS: Happy new year and happy to have you back from your break! I wouldn’t stress too much about those dips this year J-Money – you’re sky high in the new worth zone, and are bound to set the odd record or two when you’re sneaking up on the $1 mil mark! My portfolio did worse because I hold 45% Total international. International took a big dive this year. International shares are having a big sale right now. I actually probably should diversify more into international but I just love how simple and streamlined my current 1-fund approach is :) I feel like being invested in the broad market already gives you a little international action anyways due to how connected our world is now? Or is that just a myth? Most of my portfolio is in aggressive growth stocks. Oops! Thanks a lot tech. The yield curve just keeps getting worse! Oh well, better to go through a recession half a decade before I retire than when I retire. I like your positive approach to issues. Instead of lamenting about the loss, you still have a reason to give thanks. In investment, loss should be expected at times. It is not all “up, up and up”. As they say, when the going get tough, only the tough keep going. I hope this year will be much more better. Haven’t looked at our Vanguard account for a month!! We’re in it for years to come so will let it ride. Can you post about tax refunds? How, exactly do you get one? Are there tax benefits for how you invest? Last year I made 47,000. Almost half of that income went to daycare payments. I still pull out the most tax that I can each month. I get a small tax break for classroom supplies because I am a teacher. Still, in the end, I had to pay taxes! I almost cried. The amount was small, but still, it was a struggle to get them paid. I had to work a few side gigs that month. I’m not a tax expert so can’t help you much there, but I do know you can tweak how much gets taken out/left alone in your checks to a degree, so you could always alter it by paying more over the year if you want to get a nice check in the end? People either love or hate that because you’re pretty much giving the gov’t a free loan, but if it helps you save more in the long term I think it’s fine. At your income, I imagine there are tax breaks for funding a retirement account, so you might want to see if you could spare cash to take advantage of that. There are lots of deductions for people who own their own businesses, fewer for employees. I am living in blissful ignorance. I usually check Personal Capital at least 1x a week for an updated net worth. I haven’t checked since before Xmas. I see no reason to burden myself with bad news. I’d love to see if I can get through Q1 without checking. I’m still investing of course, just not checking my total net worth. yeah, seems like you’re not alone in the “no looking” game ;) I only log on once a month for these reports, otherwise it’s mostly in the background totally out of my mind! Love this post. A great reminder why I love reading your blog and why I love sharing your site with my 18yr old nephews. It’s fun and full of wisdom, all at the same time. You are right, we should be so fortunate to have money to lose. Thanks for putting things into perspective. That is so cool that you share it with them!!! Thank you!!! They are going to be SO FAR AHEAD if they actually take action! ;) What a blessing that would be so early on in life. The last quarter is a mess for me too. I am down so much that I don’t even look at my portfolio. Just let the wave pass because I know I have a few more years before retirement. But there is always the temptation to sell but got to keep the course. New Van??? What the heck….I miss the “good old days” with “Franken-Caddy”…It seemed like people just could not help but run into that car!….continually….Do you miss it? And secretly hoping to replace her one day with another – once I’m no longer playing chauffeur for my kids. Gotta love that inverse mindset that when you lose money you’re grateful for having the ability to be invested on top of daily living. The more you lose the more you have in right? I am kind of new to your website so this might be a silly question with an obvious answer, but right now trying to figure out where you list on your monthly reports how much you invested each month. I assume when you are in the green for Cash savings–that’s how much you added towards your “savings for whatever/rainy day” fund. But where do you list how much you invested into your Roth IRA or Brokerage as I see only whether the value went up or went down:) Hope that makes sense. Excellent question, and it does make sense! The answer is a pretty simple one though: currently I only invest once or twice a year when I go in to max out the retirement accounts one by one. The reason for this is that my income fluctuates so much as a self-employed “business” owner, and I never really know what amounts I’ll be allowed to put in until I do my taxes. So even though I *prefer* to invest continuously throughout the year for dollar cost averaging effects, I just wait until I have the final numbers and then invest at that point. Usually around Feb or March of every year. Why don’t you include your business assets in your net worth? You own other assets (e.g., blogs, coins) correct? Don’t they have some value? 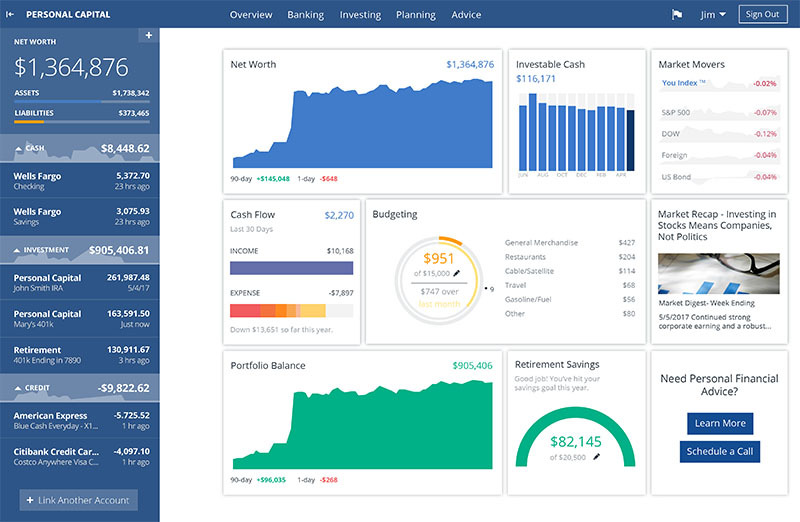 I am trying to create my own net worth spreadsheet and am having trouble determining whether or not to include my side hustle sole proprietorship biz assets, checking account and liabilities on the net worth. Thoughts? So again, really just depends on what YOU think makes the most sense :) And don’t be afraid to change it up over the years either! I used to include our kids’ 529 accounts in our net worth as well as other things but then decided I didn’t like it so switched… You’ll always be tweaking it over time and there’s nothing wrong with that. Next post: A useless but fun perspective on money.